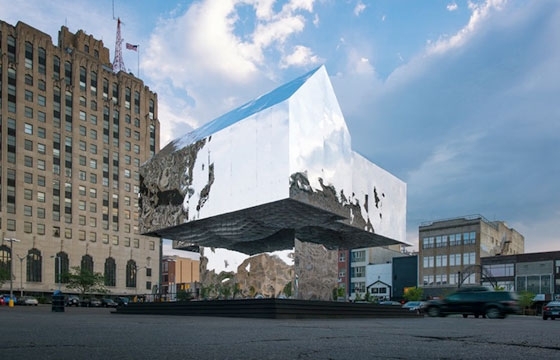 A 28-foot-tall tudor-style structure with reflective mylar has been built in a downtown parking lot of Flint, Michigan by architect William Villalobos with colleagues Cesc Massanas and Tomas Selva. Mark’s House pays tribute to the causes of the difficult housing market that has brought foreclosure to an overwhelming amount of homes in Flint. "People don't only lose a house; they lose a bunch of memories that are recorded in the back of their brains that are attached to something physical," says William Villalobos. To reach out past their own local community and connect globally, the underside of the structure contains photos of Kickstarter supporters who helped this project materialize.